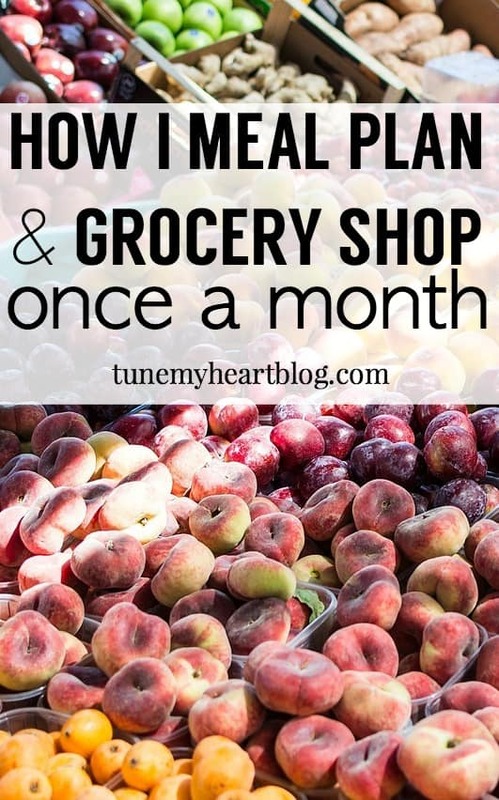 I mentioned in a recent post that I’ve grown to love meal planning and grocery shopping for the whole month at once… and while that might seem overwhelming to some of you, today, I’d like to share a few tips for those of you interested in giving it a try! Everyone’s first question is probably, what about fresh produce? 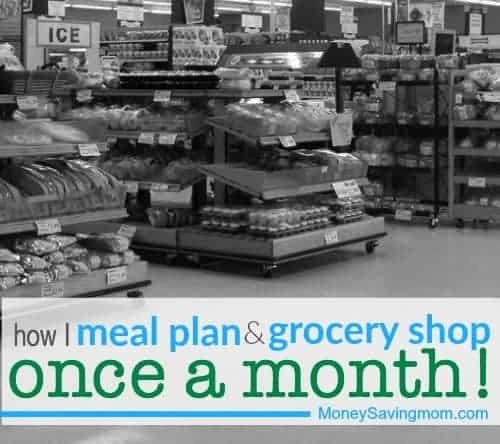 Confession: I “cheat” and make 1-2 extra Aldi stops each month, for fresh produce. As much fruit for snacking as I think we’ll eat before it goes bad. Salad stuff & fresh broccoli or some other green veggies. We usually do one veggie with each dinner. So, we eat the salad stuff first, then the fresh green veggie, then the frozen ones. By this time in the month, I’ll run to the store for produce only and repeat. Sometimes in one of these quick trips, I’ll have to get some cheese, eggs, or milk. Any produce needed for my first 2 weeks of meals. In my mid-month produce trip, I buy the rest of the produce for the rest of the meals for the month. I would highly suggest finding a LOCAL blogger who lists all the local grocery ad’s sale prices each week. Here’s how I do it. As you’re making your grocery store list (for Walmart, or any store that price matches), write the quantity, price, and store next to the price-matching items so that you can easily tell the cashier the prices. 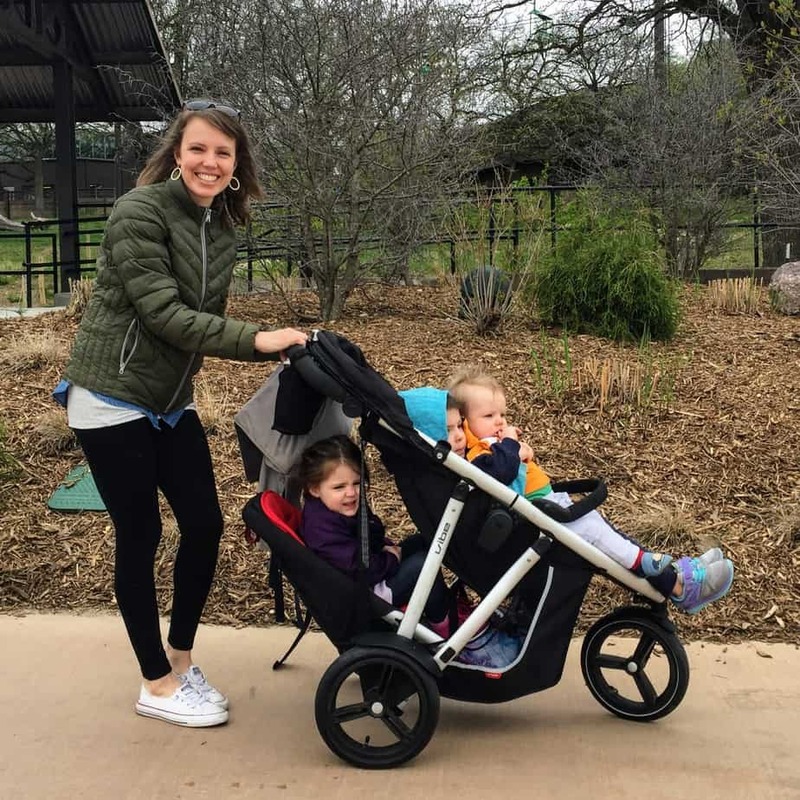 Using an all-in-one list once a month makes it easier to plan a menu around the sales, rather than having to flip through all the Sunday ads each week. lol!! I know, those color coded breakfast/ lunch/ dinner ones? More power to ’em but they’re not for me. breakfast? I just always have eggs and oatmeal around. Cereal if we’re lucky. But if it runs out, you can have eggs. haha. & life just happens. Sometimes our leftovers last longer than I think so all the meals get pushed back. As long as everyone’s fed and we stay under budget, it’s a win in my book! I love that your monthly menu is scribbled on a calendar with arrows and dates for leftovers. Makes me feel like I’m not as inept at grocery shopping as I think ??? ?